Enjoy spectacular views of the turquoise waters that are directly out the wall of glass and huge sliding doors. This high end Mediterranean style home has 3 bedrooms and 2.5 baths and best of all it is directly on the beach. With three bedrooms , two dining areas and a full kitchen this home has enough room for all. You will enter through the custom double doors and walk up the grand oak staircase to main living area freshly decorated with high end furnishings. This is an elevated home and the location is perfect to enjoy all activities on the island. The swimming beach has a gradual slope and is perfect for the whole family. Lounge in calm waters and help the kids build sand castles as you watch Dolphins swim by. Summer and fall months bring warm waters and make this the best home for you and your family to take full advantage of the beach and water. Many beach boutiques and restaurants are all within walking distance. Enjoy a stroll down the beach, combing the sugar white sand for that special shell. Stop at one of the beach restaurants and savor a tall cool drink as you listen to the one man band. Stay for dinner and become mesmerize as the sun sets slowly on the horizon. The sunsets on the island are unforgettable. After a night on the town, Relax and enjoy the cable TV on one of the lush comfortable sofas in the main living area. The next day plan a day trip to that deserted island you see from your private balcony, Egmont Key is only accessible by boat. Rent a craft from the local marina or hire your own guide. There is many activities like deep sea fishing , sailing tours, dolphin watching and bay fishing that are easily reserved and depart from the island on your schedule. Restaurants range from street or beach side terrace to 5 star fine dining. You will be able to indulge your pallet with a wide variety of fantastic cuisine. The island is 7 miles long and you can walk unobstructed from one end of the island to the other. The island will bring you back in time to the way Florida used to be. When the beaches were not loaded with condos and sky scrapers.. The sugar white sand was voted #1 many years in a row. We make reserving this home easy. Just contact Alex and he will walk you through the rental process and help you reserve this home for the vacation that will be etched in your memories forever. This home is on the coveted Northern end of Anna Maria Island and is in the best location to enjoy the true "old Florida" . Step back in time to the way Florida used to be before the high rises and condos. Single family home are the norm in this section of Anna Maria and The swimming beach is the best place to enjoy a fun safe vacation with the family. Everything was great with location and views. The house has a lot of space and laid out well. You are in walking distance to the Rod & Reel Pier for eating out, drinks, and fishing. You can even walk to the public beach if you want but we never had a reason to. We enjoyed walking right out the back and swimming in beautiful clear water with white sand. The town of Anna Maria is a resort community without the fence. Enjoy uncrowded beaches and great restaurants without long waits . Rent a golf cart or scooter and tour the island. This home is in the quaint village of Anna Maria. Beautiful boutiques and shops are all within walking distance. Great views of the beach and water from almost every room in the home. This Beach House sits directly on the beach. The home looks over the beach and water. You will see Dolphins, Manatees, Fish and exotic Birds the call the beach and water home. Water views from almost every room. This 3 bedroom home is direct waterfront. Not new construction-home at least 20 years old. Located on bay and not gulf-no sunset or sunrise, limited beach with high tide, lots of grass and pine needles on beach-very messy. Many items not working-including rips in screens and screen doors rusted off. 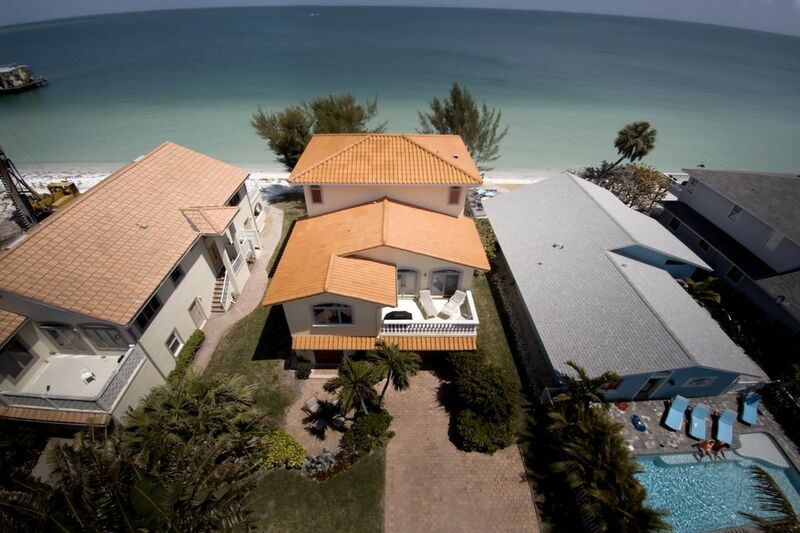 We loved our stay at this house and on Anna Maria Island. The location couldn't have been better. You walk out the back deck, onto a beautiful beach with white sand, clear water and dolphins swimming by all day! We rented bikes and kayaks and walked to the Rod and Reel Pier to watch the sunset. The house has lots of room and was very clean. The kitchen had everything we needed as well. I am so happy you loved our home as much as we do. We purchased this property in 1963 because it was an awesome spot. Our family has be here for 4 generations and we are so happy to share it with others. Thanks again for staying with us you are always welcome. Beautiful property with amazing view! We enjoyed our week at this rental. Every morning we had the pleasure of watching dolphins from the balcony. You couldn't ask for a better view! I would definitely recommend this place to anyone. However, we did have one concern with the neighbors. We often felt like we were under the microscope while being outside. I would strongly caution anyone with a family to strictly monitor their noise level while enjoying the outdoor space there. Other than that, it was great!